I've been a subscriber to National Geographic magazine for many years, and I've always been impressed by the quality of that publication and other productions by the National Geographic Society. So, when I was asked if I would write a review of their new book, Backyard Guide to the Night Sky, I was tickled pink and jumped at the opportunity. The book I received (cover shot above) is a paperback, roughly eight inches tall and five inches wide. It's easy to carry around, and the pages are a fairly heavy stock, similar to other high-quality field guides I have from the Audubon Society. I wanted to test and see how the pages hold up to damp conditions like backyard astronomers might experience on a dewy night, but due to the ongoing massive drought here in Austin, I didn't have such a night for a test. However, it did rain about a week ago, so I sat outside (under a porch) and read for about an hour with no noticeable effect on the book. I did notice that my fingers would leave prints on some of the black pages in the book, but these prints disappeared within a few minutes. The numerous prints, photographs, and illustrations were all sharp with vivid colors. So, the overall impression I have is that this is both a beautiful and durable book. The layout of the book struck me as fairly clever. The book is split into ten chapters that cover both the science of astronomy and the basics of observing that any beginner wants to know, from the very basics on learning the night sky, to the planets of the solar system, to a description of individual constellations, to discussions on types of equipment the beginning astronomer needs. Within these chapters, a different topic is covered on every two facing pages. I found this a very nice feature. Only have a couple of minutes? Read the next page in the book, and you'll get a complete thought. Or if you want a quick bite of a random area of astronomy, just open the book and start on the upper left of any page. The portions of the book covering amateur astronomy contain some unique features I haven't seen in other books (though keep in mind I haven't read any other astronomy guide book for at least 15 years). There are tips for sharing the night sky with children, including points that I wouldn't have thought of on my own, such as how just hearing stories of constellations will likely be far more satisfying than spying a distant, faint galaxy through a telescope. The discussions of astronomical equipment are also up to date, covering topics such as digital cameras and computerized telescopes. A chapter on the seasons of the sky points out striking star patterns visible during each season, a very useful topic for beginners who are frustrated when they can't find Orion on a balmy summer evening (Orion is a winter constellation). However, this book does have some deficiencies. I was disheartened by a number of minor scientific inaccuracies throughout the book. For example, in a discussion on the composition of the sun, the claim is made that the sun's core is composed of 92% hydrogen, 7% helium, and trace amounts of the other elements. The following sentence then claims that the outer layer of the sun has "substantially more helium": 25%, with 74% hydrogen and trace amounts of other elements. In reality, the composition of the core and outer parts of the sun are virtually identical; the first set of numbers (92% hydrogen, etc.) is the sun's composition if you look at numbers of atoms, while the second set of numbers (74% hydrogen, etc) is what you get if you look at the relative masses of the various elements in the sun. Most every science section has at least one minor error or slightly misstated fact like this. Now, you might consider this nit-picky, and maybe it is. It's not as if the book makes egregious errors like claiming that Pluto is the largest planet in the Solar System (which I actually saw once in a video) or that the stars are powered by billions and billions of hamsters running in little wheels. But I expect a higher level of quality out of National Geographic than I would from other publishers, and these little errors don't meet my expectations. There are some errors on the backyard astronomy aspect of things, too. For example, the Summer Triangle (made up of the bright stars Vega, Deneb, and Altair) is one of the easy ways to learn your way around the summer night sky, and the book makes that point very clearly and correctly. This point is illustrated by a photograph of the summer sky and with the stars of the Summer Triangle labeled. Except every single one of the stars is mislabeled. One of the labeled stars isn't even in the Summer Triangle. Oops. And, while the magnitudes of stars are given throughout the book, I didn't find the fairly important concept of magnitudes explained. Perhaps I just missed that page, but there's no reference to magnitudes in the table of contents or the index. Finally, let me make a few other random notes. First, this book is written for people in the northern hemisphere. While a few mentions of the absolutely marvelous southern skies are made, this book is not appropriate for the beginning astronomer south of the equator. The photographs and illustrations are numerous and quite vivid, but the captions are usually quite terse; I often found myself asking, "Which star cluster is that?" or "Which satellite took that picture?" Lastly, the authors make an obvious effort to try and refer the reader to a variety of astronomical websites, but there are some glaring omissions. For example, under a listing of websites of national and international astronomical organizations, there is no mention of the American Astronomical Society, the Astronomical Society of the Pacific, or the American Association of Variable Star Observers, three of the major astronomy organizations in North America. It's not reasonable to expect a comprehensive list of websites, books and museums, but the listings are rather sparse and somewhat random. 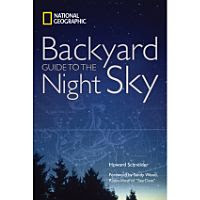 In short, I'd say the Backyard Guide to the Night Sky is a well-designed and beautiful book with several novel concepts, a layout useful to even the most short-attentioned person, and a slew of useful information for the beginning backyard astronomer in the northern hemisphere. This is also a fine book to encourage a general audience to go out and enjoy the wonders of the night sky while learning a little science along the way. However, the book is in need of careful scientific editing, as there are a number of (generally minor) scientific errors throughout the book. This is disappointing, and for this reason I don't believe the current edition of the book is appropriate for those who can already find their way around the sky and may be looking for a more in-depth look at the science of astronomy. I agree with all the points in this review, good and bad. The pictures are beautiful but the authors were incredibly sloppy with their proofreading: the English-to-metric conversions are inaccurate; the diameter of the sun is given as 924,000 miles when it's actually 864,000; the diameter of the gas giants is given to the nearest *mile* when this is plain silly and very misleading; the distance from the sun of these planets is also stated to within *ten miles* which is even more ridiculous; and there is no consistency generally when it comes to the precision of these numbers: when you're writing an elementary book for beginners a precision of more than three or four digits only obscures the point and makes comparisons difficult. National Geographic dropped the ball with this publication and should withdraw it until these gross errors are corrected.